Which Bible do Amish use? Typically, the Amish use the German Martin Luther version, particularly for church readings. For an English version, the most favored translation is the King James edition (KJV). Some Amish use the New International Version (NIV) as well. Often, the Bible Amish read in the home will have a dual format-German on one side of the page, English on the other. Amish speak Pennsylvania German, English, and have varying degrees of fluency in High German. So an English translation can be useful. When I visit Amish friends in Pennsylvania, I sometimes get asked to read a chapter after breakfast. Since I speak no German the English comes in handy. I sold Bible-oriented books in Amish communities over four years, which is how I first met the Amish. One of the books I sold was called the Layman’s Bible Encyclopedia, a 1000+ page book with definitions of Biblical figures, terms, and concepts. It was quite popular among Amish. I believe my customers appreciated the convenient reference and clear explanations. I found ministers in particular liked it. Amish also make use of concordances, which list where individual words and concepts can be found in Scripture, and their context. Another of the products I sold was a Bible story set called the Family Bible Library. 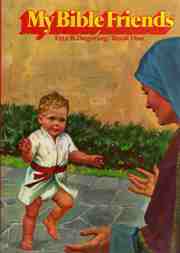 Bible story books are common in most Amish homes. Lower-order groups such as Swartzentruber Amish are less likely to have Bible story books, but otherwise most Amish do. The Egermeier’s book is a single volume particularly popular among Amish. When it comes to sets, you typically have a few main kinds: My Bible Friends, which is a five-book set with large illustrations and few words, and which is oriented to younger children. The Bible Story, a 10-book set which is also known as the Arthur Maxwell series, is also quite popular. Both of these sets are commonly available in bookstores in Amish areas and for purchase online. Then you have the Family Bible Library. The Family Bible Library, or FBL, was published for nearly 40 years by the Southwestern Company of Nashville, and sold primarily direct to customers. This is the job I was fortunate to have for a few years. As far as I know the FBL is no longer printed. The Family Bible Library differentiates itself from the other sets on a couple of counts. The set consists of two elements–Bible stories, encompassing the Old through New Testament, which are simply written and illustrated. The illustrations are attractive but in some ways not quite as vibrant as those in the Arthur Maxwell set, for instance. Nonetheless I found they appealed as their artistic style was different, and some of my customers felt these images were “more realistic”. The stories themselves were plainly written, and included “lesson questions” at the end, which were oriented towards children and reviewed the main themes to drive home the message of the story. I found Amish mothers in particular quite liked both of these features. The simplicity of the stories they said made it easier to translate into Pennsylvania Dutch for their younger children. And the ready questions gave them something to ask the children, rather than having to make up their own. I found that Amish parents, like others, saw Bible story books not only as “upbuilding” reading but as teaching tools. The second part was the background information in the books. For instance, the FBL includes timelines, family trees of Biblical figures, as well as explanatory information which helps give context to the stories. For instance, the set has maps of Paul’s missionary journeys, and a section on what bulrushes were used for in Old Testament times (they were made into paper and even sandals). This feature I found extended the appeal of the set to adults. What was interesting was that on more than a few occasions Amish ministers told me they had found the books to come in handy in preparation for church. In particular they had used the set to review the sequence of Biblical events in preparation for the Council service (during the lengthy Council meeting, which happens twice a year preceding Communion, Amish ministers preach the Biblical Story from Creation through the conquest of the Promised Land, and then into the New Testament and Christ’s teachings). Often, Amish customers who already had other sets like the Arthur Maxwell set would purchase the Family Bible Library, because of the differences between the two. I also met numerous people who already owned the sets. I remember one family had received the books as a hand-me-down from their parents. The grandfather in this case, a bishop, had purchased the set from a salesperson in the mid-1970s. I mentioned above that I felt fortunate to do this job. One of the reasons was in seeing this staying power of the books themselves. It was not uncommon for a family to have had them for 20 years. The durable construction helped. The covers were a dull tan and brown–not the most attractive, but plain and a good tone which showed less dirt and wear. And they were tough. Typically I would operate by taking orders and delivering the books a few weeks later. Delivery period was always a lot of fun, as the children were typically excited to be getting new books. The joy they showed on delivery day was a reward in itself. Often I’d hear from mothers that their kids had been watching all day for my red truck to show up. So I got to feel a bit like a Bible story Santa, I suppose. I eventually sold over 1,200 sets to Amish families, in five states and around 15 communities. It is still nice to think that on Sundays families may be using the books to delve into the background of that day’s Scripture reading, or sitting with their children weeknights to share a bedtime tale and a good lesson. That thought is a reward that has continued, even after the job itself has finished. So the Amish use the King James and the NIV as a matter of tradition or faith? I know some people believe that these versions are closer to the original intent of the scripture. While others just use it as a matter of tradition. Me I prefer the most modern language translation like the modern living translation. But people will say this is not an authentic translation. So I guess my question is, what would the Amish view on a new fangled Bible translation. My second question is who are the authors of these Amish Bible story books, are there any Amish authors from the Amish community that write these books? Maybe the community is not large enough to have a critical mass to produce writers. My Third question is if they did print their own books would they print it with modern machines, old style type set or outsource it? I confess: I once, about age six, cut up my Bible Stories book, glued the pictures down on paper, and wrote my own Bible. To compound the sin, when my mother found the mutliated book, I blamed my sister. Erik, thanks for the information on the various books. I would love to find some when I am down to Arthur next time. Mark, there are a lot of writers in the Amish community as a whole but I do not know if they were involved in these particular books or not. The books do sound very interesting. As a side note, I prefer KJV myself. I have compared various versions many times and feel some of the newer ones really lose a lot in the translation and sometimes even completely change the meaning of a passage to reflect a more worldly point of view which is not necessary to be correct. Magdalena’s story is hilarious.Did you ever confess to the crime? No. It had slipped my mind until recently. I was never found out, either! It’s probably why I’m willing to confess it now! I used to work in a Christian book store and had the task of learning about various versions of the bible. I lay no claim to expertise! 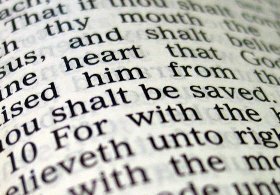 It was surprising to me to learn that some of the newer versions of the bible are infact more accurate than the good old KJV. When we look at the word love for instance there are a few different types of love decribed in the original greek and hebrew texts. So these newer versions use THAT particular type of love definition in the translated scripture spots. Or wine, there are different ratios of water to wine (daily table wine for purifued water to heavy alcoholic content wine for “strong” drinking) and the greek is better translated. You get what I mean. Though time and learning, and let’s face it, trusting the masses to understand scripture on their own…. linguistic scholars have allowed us a clearer picture of what exactly was being said. Not to change the meaning but to clarify it. I personally adore the New Living Translasion for this purpose. I continually compare versions and find the NLT unfolds the KJV into broad day light for me in the current dialect of english we speak. It has lost no romance in literary structure but become something I can hear God’s meaning in simply. I have inherited a set of The Bible Story – A. Maxwell from my parents. They had received it as a wedding gift in 1973. I admit that I have yet to put them to bedtime story use. We have a 5 book set called Uncle Aurther’s Bedtime Stories that my children have been enjoying. They belonged to my grand parents. I could see how such gentle and colourful story set would be an Amish favorite and teaching tool. Great post Erik, I have often wondered about this very thing. Here’s a question I only recently thought of. Traditionally the Amish use what could be called “Protestant Bibles”, but in the wedding ceremony, there’s a reading from the Book of Tobit, which is an apocryphal/deuterocanonical book (in Catholic Bibles, but not Protestant ones). Why is this? Does the Martin Luther Bible include this book? As a fellow Southwestern Company alumnus I especially enjoyed reading this post; though I sold books through the educational (secular) side of the business. For those that are not familiar with Southwestern, they made their name by publishing bibles for the confederate troops during the Civil War. It seems that up until that time all bibles printed in the US were printed in the North & were considered contraband once the war broke out. Southwestern filled this need and lived on after the war, with college students selling their products door to door for generations. The name “Southwestern” would make you think that they are loacted in Dallas or somewhere else in the southwest, however when they were established Nashville WAS in the southwestern part of the US. I heard recently that they have sold their bible and bible based book division, though don’t know if that is true or not. To me, it would really be sad if it is true. Great comments–I’m going to try to jump in but my sched is pretty backed up today! And just one quick one, Oldkat, thanks for the background on Southwestern from a fellow alum. One thing I didn’t mention is that the Family Bible Library was redesigned and revamped a few years ago, keeping more or less the original content but brightening the design and illustrations. I had however recently heard from friends at the company that the FBL was no longer being sold by them, which is too bad. Mark–good question-confess I don’t know the story/origins of how KJV use began among Amish, though it is historically one of the most widely-used versions. It really is the primary English version used, NIV would be a minority. There are a few Amish authors–not sure on Bible stories though. I have run into PA Dutch version Bible stories occasionally, so may be some Amish authorship there. They’d employ a standard printer to produce their books. An Amish bookstore I know of has prayer books produced in China! Emily as far as I know there is some usage of the Apocrypha among Amish but I’m going to defer from commenting much as I don’t have good info on this at present. I do recall a New Order friend commenting on Old Order usage of the Apocrypha books in his community. But can’t give the background on this one right off, maybe there is someone else here that can. Tania interesting comment on language, translation and the Bible. I know it can be a very controversial subject. And, I find myself wondering just how many English translations are out there? I know we have a number of major ones, but would be curious to know how many total, more or less. You know I didn’t mention the Uncle Arthur’s Bedtime Stories, but that is another popular set, not exactly Bible stories but with good lessons, which many Amish have in their homes. Erik, would you, if you have the time, write an entry on the “Confessions” that explain, establish Anabaptist, Amish/Mennonite faith. Could you touch on how it is viewed in contemporary Amish society, perhaps as a part of the Ordnung, if of course, it is seen and used as such. Maybe I missed it if such an entry is out there. Thanks!! When a son joins the Amish: How do others react?